Roundabouts - A beautiful Way to Get Around! The Modern Roundabout - the right choice for many locations! Say Goodbye to the Notorious Traffic Circle! Just a few years ago, when driver's heard of a Roundabout, they would think of Chevy Chase stuck endlessly in a European traffic circle. Those who had encountered them found them difficult to navigate and anything but efficient. So how did this old, frustrating concept enjoy a rebirth to qualify as an Alternative Intersection and emerge as one of the most popular designs in history? Older circles required traffic already in the circle to yield to traffic about to enter. The modern roundabout inverted this, and instead required entering traffic to yield. This change, along with better channeling and other features, unlocked the potential. Suddenly drivers found them very intuitive. Just yield at the approach, then go so long as there is a sufficient gap to your left. Once inside, circle to whichever street you want, unimpeded. Say what? 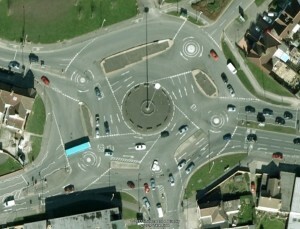 Looks like five mini-circles within a larger traffic circle in Swindon, England. Good luck with that! Visit Alternative Intersections for other crazy places on a dynamic map! 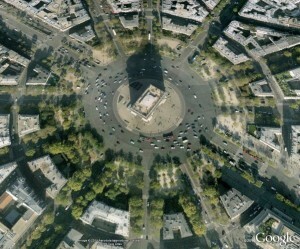 The famous and infamous Arc de Triumphe traffic circle. You can enter anytime you like, but you may never leave! Visit Innovative Intersections to find other famous places! 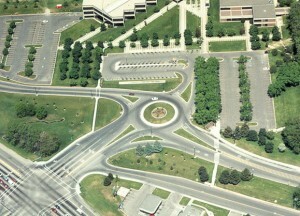 The first roundabout in Utah opened at Utah Valley University in 1996. What had been a confusing stop-yield intersection cleared up nicely, convincing engineers that roundabouts should be seriously considered. Photo and history courtesy of RoundaboutsUSA. The first few modern roundabouts were able to solve awkward intersections that were previously unsolvable, helping them earn a great reputation. With planters and monuments, they are attractive and help create a sense of place. They also calm oncoming traffic, which combined with far fewer conflict points, and have helped them prove to be very safe intersections for both vehicles and pedestrians. Single-lane roundabouts have significantly better capacity than a four-way stop. They also work well as replacements for lower-volume signals. A mini-roundabout appears very nearly the same as a regular residential intersection, but has a painted or small raised island in the center encouraging vehicles to use the right-of-way rules of a larger roundabout, but with a lower cost and smaller intersection footprint. Single-lane and mini-roundabouts are great choices for residential areas. There are only a few multi-lane roundabouts, but they are proving able to serve similar volumes as what might occur when a minor arterial meets with a major collector. In extremely high volume environments, the size of the roundabout required for high efficiency may be prohibitive. But fortunately there are other Alternative Intersections! One such option is a Bowtie, a sub-category of the ThrU-Turn intersection style. With a Bowtie, rather than put a roundabout in the center of a primary intersection, roundabouts or ellipsabouts are off-set between 300 and 700 feet. Left turning traffic first travels Through the main intersection, makes a U-turn using the roundabout, then makes a Right. Hence the name ThrU-Turn, for Thru-U-Right. A Bowtie system with two small roundabouts can attain significantly more capacity than a single larger roundabout in the center of an intersection. How did these become popular? Where can I learn more? 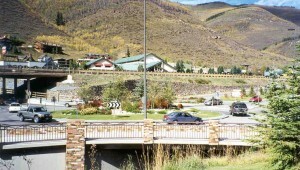 Vail, Colorado - location of the first roundabout interchanges in the United States. Designed by Ourston.com. Photo courtesy of RoundaboutsUSA. RoundaboutsUSA is among the most popular repositories of the history and current status of the use of roundabouts. They report that as of 2010, there are over 2,500 known sites in the USA, with many more mini and sub-division sites. They note that the basic changes that define a modern roundabout were implemented in England in about 1963. Leif Ourston was the first to bring them to America, opening one in 1990 as part of the Summerlin development in Las Vegas, then opening the first roundabout freeway interchange in Veil, Colorado. They took off in Utah around 1996. From these few western states they have propagated across the nation and are experiencing a rejuvenation across the world. 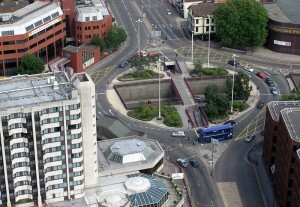 Traffic circle in Bristol, England over the top of a freeway. Notice the stop bars both inside the circle, and on the approaches. Yikes! InnovativeIntersections.org provides a wiki-type record of the locations and attributes of interesting roundabouts as well as other design styles. Because there are so many roundabouts, it is not practical nor desirable to record them all. Instead the focus is on some of the more interesting applications of roundabouts. Able to increase efficiency by reducing traffic signal complexity. Usually by eliminating or relocating left-turn phases from signalized intersections. Still uncommon, or at least was uncommon until fairly recently. Roundabouts are more efficient than many signalized intersections, and they achieve their efficiency largely by handling left-turning vehicles without the aid of a left-turn arrow. And though they are now very common, they were not just a few years ago, so they can still be considered Alternative Intersections.